The Most Versatile Keg Kit on the Market! 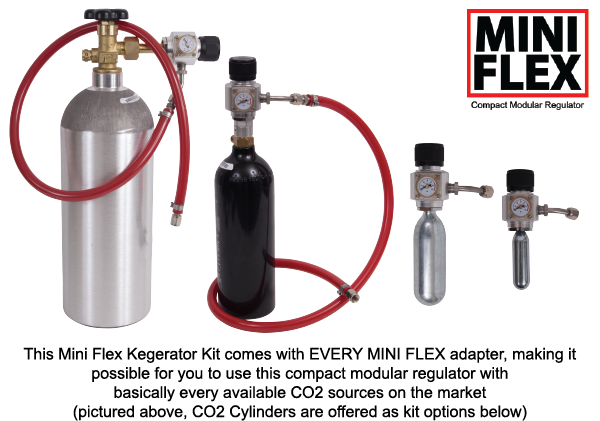 Our single faucet Mini Flex kit allows you total CO2 source flexibility. Use a industry "standard" CO2 Cylinder like the larger capacity 5#, 10#, or even 20# with the base configuration! When you want to use the smaller capacity 20oz, 74gram, and 16gram CO2 sources for taking your system Mobil you can switch over very quickly. See the video below for a more detailed explanation. CO2 Flexibility has never been so easy!